Dr. Annie Coughlin, ND is a licensed Naturopathic Doctor with the Manitoba Naturopathic Association (MNA) and the Canadian Association of Naturopathic Doctors (CAND). After obtaining her Bachelor of Science in Biology from Mount Allison University, Dr. Coughlin completed a four-year Doctoral program at the Canadian College of Naturopathic Medicine in Toronto, Ontario. 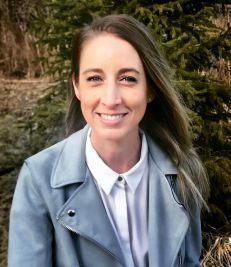 Her clinical experience includes working with patients at the Robert Schad Naturopathic Clinic (Toronto), Naturopaths without Borders (Haiti), the Anishnawbe Health Centre (Toronto) and at the Brampton Civic Hospital (Toronto), the first naturopathic teaching clinic within a hospital in Canada. Dr. Coughlin is passionate about understanding the unique nature of her patient’s health concerns. She maintains a general practice with a particular interest in woman’s health (hormonal imbalances, fertility, menstrual irregularities), fatigue, insomnia, stress management, anxiety and digestive concerns. Using a range of naturopathic therapies including Acupuncture, Intramuscular Stimulation, Cupping, Traditional Chinese Medicine, Botanical Medicine, Lifestyle Counselling, Clinical Nutrition and IV Therapy, Dr. Coughlin strives to develop effective individualized treatment plans to empower patients to take control of their health journey and experience well-being.